Welcome Message - Link to inspiring WYN Video, Annual Report. Tracking Donations - Reporting value for taxes and determining bid prices. Donations for our Tree - Letter to use in asking for donations, guidelines. Tree Themes & Gifts - Examples & suggestions for tree themes, gifts. Advertising & Marketing - Tips to help promote your involvement with the festival! Thank you for supporting WYN! Your involvement makes a lasting difference in the lives of these kids. We are thrilled & grateful for your involvement in the 5th annual Festival of Trees (FOT). We can't thank you enough for joining in the festivities -- Western Youth Network (WYN) will truly benefit from your kindness, as this event contributes important funding for this outstanding organization. We know you have varying levels of familiarity with WYN. Please watch this heart-warming video to see how WYN has positively influenced the path of a young girl's troubled life. Please share this video with others who may be working on the project with you. I am also sharing WYN's annual report from 2018. It is sure to inspire you to make your design not only the prettiest or most creative it can be, but also to be creative & bold in adding value to the goods within or under your tree! The FOT committee is happy to help you brainstorm at any point - just ask. You can reference Designer Guidelines and see a few pictures of last year's event. VIP Reception - Come celebrate with us! Now through October - - Please submit the Designer Registration Form. We'll save your space and start publicizing your involvement. Friday, October 25 - Please submit your tree theme. The goal is a variety of themes, so remember themes are first come/first serve. If you need suggestions or want to brainstorm, let us know! Wednesday, Dec. 4th - 2pm-8pm - Set up time! Come do your magic. Designers are welcome to take wreaths and small trees off site to decorate, if more convenient, and return before we close on Wednesday evening. Large trees must be decorated on-site. Thursday, Dec. 5th, 5pm-7pm - VIP Reception. You will receive an invitation for this reception, intended for Tree Designers, higher-level sponsors, WYN Staff & Board, and Festival Planning Committee. RSVP will be required. This is a private event. Thursday, Dec. 5th, 5pm - Bidding opens for trees. Be sure to post a picture of your tree and the link to the Auction site on your social media pages. a) If you claim personal donations on your taxes, these records will be your documentation. WYN will issue tax letters following the event and your personal contributions will be based on your assessment of items purchased. c) It is imperative to follow up with each entity that might contribute to your design; WYN will provide a follow up / thank you letter following the event for you to distribute. This will serve as their tax documentation and will contain WYN’s tax ID. If so, attached is the official letter that YOU will give to businesses or organizations that will serve as a request (or a follow up at this point); you will then follow up with any contributors after the event with a thank you & tax receipt that we will provide. IMPORTANT: see here for a list of businesses already contributing (sponsors and designers) and please steer clear of asking these specific businesses for further donations. TIP: Many of you will be out asking for additional donations on behalf of WYN. 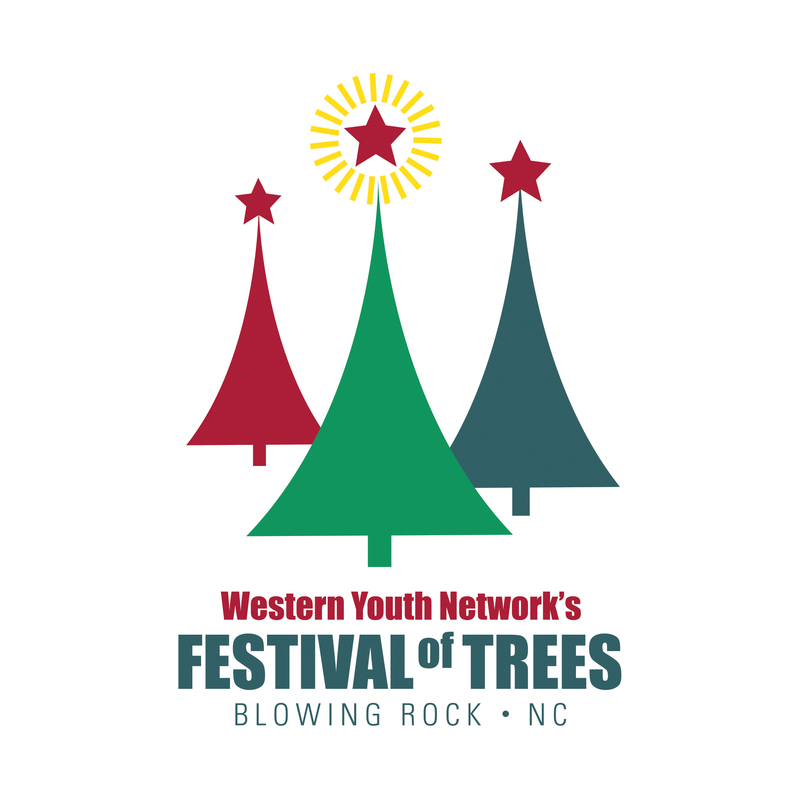 Please know many businesses contribute, and a good starting place is "Do you know about Festival of Trees and Western Youth Network, and are you already supporting this event in some way?" If they are already contributing, please thank them! A word on trees, themes and the "gifts" we refer to ... Each tree has a general theme, and the hope is that there will be associated gifts & goodies that will also add value to your design. This is a fundraiser, of course, so pack some gifts under that tree (and potentially in the tree, incorporated into the design)! See above photo gallery for ideas. Golf = there was a 6-foot golf tree that included rounds of golf foursomes to various local golf courses & a few golf accessories. Decorated with golf balls & tees amidst the ornaments. Animals = animal themed tabletop tree had various stuffed animals, animal education items, binoculars & safari hat, a framed wildlife print, entry passes to NC animal attractions, and a large gift card to the NC Zoo - enough for a family annual pass & other assorted costs. Big Bang Theory = tree could have great direct accouterments related to the show, but could also include passes to various science museums in the State to round it out ... get clever! Caution #1: There is a delicate balance between making a full & awesome package of gifts, and just putting "stuff" at the bottom of the tree just because it happens to be related to your theme. Please concentrate on what YOU think would be fun to personally own or to give as gifts, and let that be your "quality" guide! For example, a Dr. Seuss themed tree one year was decorated in a festive & quirky spirit, contained a few Dr. Seuss items for continuity in theme (books/video/hat for tree topper), and then focused on "Oh The Places You'll Go" and packed it with gift cards to local places ... ((because who really needs $500 worth of just Dr. Seuss stuffed animals and books?)) Make sense? Caution #2: Bigger does not always equal better. More value does not always equate to our whole priority, philosophy, or goal. We want to achieve various price points on our trees and offer well-rounded options for trees & wreaths for people to purchase. If your intuition tells you your tree is at the right dollar point and you are closer to the minimum, go with it! Spread the word! Friends, co-workers, church families, schools, and other personal networks. We’ll create an "email blast" later this year. Shoot it out to your business listservs or put in an upcoming e-newsletter, send to personal contacts, as well as Facebook. Download this great event poster (coming later this year) to hang in your business, places where you shop, etc..
Add or feature FOT on your business website -- For instance, one year, The Gamekeeper promoted the event as one of their top web banners, with a "Come see our tree!" Let us know if you need a different graphic to help with an idea you have. Our website - again - is wynfestivaloftrees.com, Download our logo if you’d like to use it on your marketing communications. “Like” our Facebook page, and share it on yours! Share the Auction site (coming later this year) with your network. 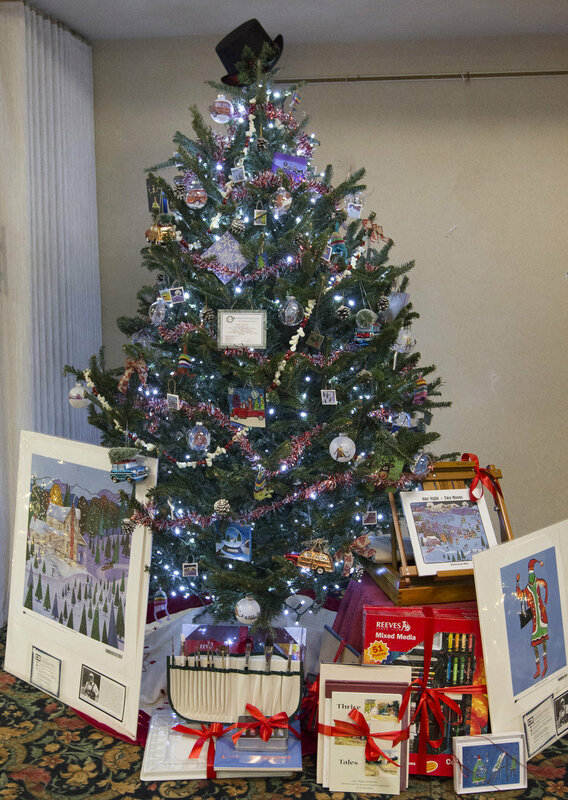 Items for auction will be added once the trees and wreaths are set up on Wednesday, 12/4. Share what you do with us! It helps us to give other people ideas!